Through data and transparency, USGBC will expand LEED's reach around the globe. As I get settled into my new role as president and CEO of USGBC and GBCI, I am deeply grateful for the opportunity to continue serving this dynamic and impressive organization of ours. Since joining the USGBC team more than seven years ago, I have felt enormously appreciative not only to work closely with Rick Fedrizzi in executing his vision for LEED, but to be in a position that allows me to give back to others and to serve the critical mission of our organization. Every single day, I wake up invigorated by the spirit and strength of our work. And in this next chapter, I pledge to further modernize and enhance USGBC and GBCI’s capabilities, while striving every day to bring more people into our global movement, to widen our sphere of influence, and to innovate beyond our wildest dreams. Now is the time to show leadership by bringing people together and by focusing on what unites us, rather than what divides us. With great optimism for the future, I would like to share my 2020 vision for USGBC. By combining USGBC’s collective, community-wide creativity and spirit of innovation and our wide range of resources, we will provide best-in-class products, services and programs to the global green building industry with the goal of furthering sustainable building practices across the world with purpose-driven speed. This requires a digital USGBC. We will continue to invest the necessary resources to develop platforms and technologies that will disrupt the market and offer superior convenience, insight and benchmarking to our customers and the green building community at large. Our continued focus will be to establish ourselves as the number one leader of market transformation and customer experience. USGBC is recognized globally for market transformation, and GBCI is the leader of speed to market transformation. Together, they are creating unstoppable momentum in the marketplace, covering nearly every sector of the sustainability industry. USGBC and GBCI will redefine performance and offer real tools to benchmark, measure and manage ROI (return on investment and return on impact). Further the use of LEED in the global marketplace. Offer best-in-class sustainability education on its Education @USGBC platform. Remain the global thought leader on green building. Serve as the global convener for the green building movement. USGBC commits to investing in the future by developing the full potential of the diverse, committed and passionate people who power our movement. Only by aspiring to, and ultimately achieving, organizational excellence and optimum efficiency across our movement will we be able to solve the challenges of tomorrow and realize the vision and mission of USGBC within a generation, writing a new story about people and their stewardship of the built and natural environment. GBCI is the premier organization for independently recognizing excellence in sustainability performance and practice globally. It will consistently advance our strategy to create new markets, build capacity and create value. In support of this, GBCI will continue to offer a diverse array of sustainability certification systems, extensive reviewer knowledge and resources, a suite of professional credentials and certificate programs and excellence in customer experience. Through rigorous certification and credentialing standards, GBCI will drive adoption of green business practices that foster global competitiveness and enhance environmental performance and human health benefits. The 2020 vision has two key focuses: 1) data and performance and 2) transparency. These two tenets are foundational to the success of USGBC and GBCI across a growing community in business operations and the ability to innovate in a digital world. Over the last two decades, USGBC and GBCI have gathered more green building and business data than any other organization in the world. This data reveals enlightening trends and patterns in green building practices and global markets that can be harnessed by the marketplace to make educated, strategic business decisions and leverage emerging opportunities. Since 2012, USGBC has been developing new ways to provide greater transparency and understanding of the various dimensions of the built environment through these tools. Data and performance is the first anchor of the 2020 vision strategy. As part of this effort, USGBC has invested heavily in its LEED Online platform, a cloud-enabled solution that guides LEED projects from start to finish. LEED Online and its powerful infrastructure sets LEED apart from any other green building rating system. In 2014, USGBC launched the LEED Dynamic Plaque, our answer to true real-time performance monitoring of buildings, communities and cities. Last month, USGBC announced that we have developed a new platform that combines data, mobility and the most disruptive technologies on the horizon. This platform, a new company called Arc, will take the LEED Dynamic Plaque to the next level—it represents the new era of green building. A complement to LEED and other green building rating systems, Arc allows buildings and spaces to compare performance metrics and connect to green building strategies. In doing so, Arc enables any project that uses the platform to make incremental improvements, earn LEED certification or other green building rating system certifications and make more informed decisions in operations and maintenance issues. At USGBC, we are also shifting our focus from buildings to communities to cities, and through Arc, we will facilitate smart cities on a global scale through an integrative approach to sustainable development and city planning. Arc will integrate all of our current and upcoming USGBC and GBCI offerings into a single global platform. LEED buildings will make up one subset of the platform, which is designed to evaluate a city’s integrated ability to implement energy efficiency, water preservation, waste management, citizen health and wellness and sustainable land development. This will allow key decision makers to identify challenges and guide the planning, implementation, management and operations of sustainable, high-performing venues, communities and cities. USGBC has already incorporated data for 100 cities in the U.S., 55 cities in India and 43 cities in China into this platform. Today, LEED is a full-scale global movement. All over the world, it is undeniably an economic development tool. The numbers speak for themselves: LEED is everywhere, with over 34,700 certified commercial projects, representing more than 5 billion square feet of certified space, with an additional 47,000+ projects in the pipeline waiting to be certified, which will add more than 10.7 billion gross square feet of space. Every day, more than 1.85 million square feet of space certifies to LEED standards, and more than 5 million people experience a LEED building. The international demand for LEED also continues to grow—LEED is currently in use in more than 160 countries and territories. Over the next 10 years, LEED’s growth rate is only expected to continue—both at the domestic and international level. The future of green building in the United States, and all over the world, is extremely bright. Our goal is to expand LEED to all the markets and ensure a sustainable future for all. USGBC has also focused on developing critical partnerships aimed at expanding certification resources abroad, localizing customer service in several countries, and localizing LEED offerings. Strategic partnerships with groups such as the International Finance Corporation, Delhi Metro in India and the Bureau Veritas in China will help USGBC continue on this trajectory. In 2013, USGBC partnered with Informa, which has enabled USGBC to bring Greenbuild to Latin America and Europe. Greenbuild is poised to be held in India, China and the Middle East starting in 2017. 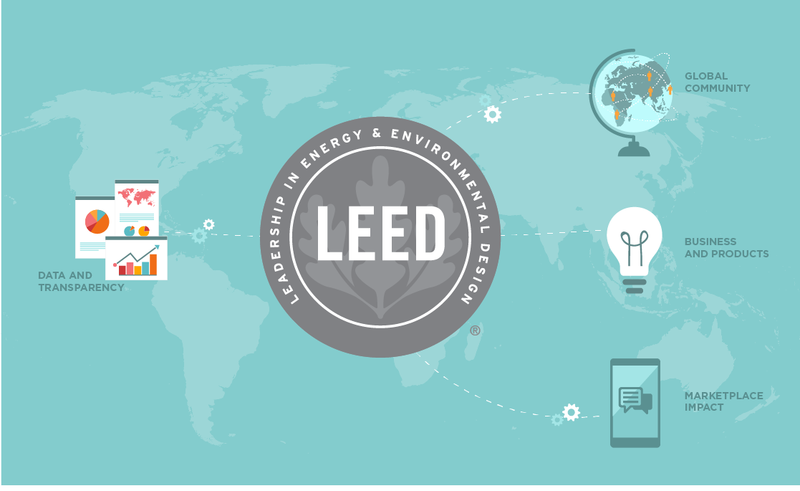 Symbolizing leadership in green building, LEED is transforming the way we think about how buildings and communities are designed, constructed, maintained and operated across the globe. Transparency is the second anchor of USGBC’s vision to 2020 and has been a hallmark of our work since USGBC’s inception. Over the next four years, we will have a greater focus on offering that transparency, which is critical not only for rating systems and their development, but also for keeping pace with the changing industry and nature of the way we do business. By understanding the ins and outs of the LEED rating system and its consensus-based development process, the green building industry can adapt to and understand the direct impacts that better buildings have on society as a whole and understand the direct issues LEED faces. Transparency allows everyone at the table to learn from our successes and shortcomings; it’s a powerful motivator and a key way to create momentum and collaborative opportunities. For exactly this reason, USGBC has established key partnerships, such as with the American Chemistry Council and a number of others, to tap into collective strength and experience toward the goal of transforming the market. At USGBC, our mantra is “partnership is the new leadership.” We live and breathe this every day and will continue to partner with industry stakeholders to push for new and better ways to design, construct, maintain, operate and occupy our buildings and communities. Continuous improvement simply means a long-term strategy to keep LEED as a leadership standard and to maintain its rigor. LEED is updated through continuous improvement, which involves a regular development cycle for revisions to the rating system and a Pilot Credit Library where proposed credits are tested and evaluated before they can be considered for incorporation into LEED. Transparency is critical in this capacity. The LEED rating system uses an open-source model and has always been freely available. This enables projects to understand the LEED system at a deeper level and adapt the system so that strategies can be applied for the project’s desired outcomes. Continuous improvement doesn’t stop at the rating system itself: it also applies to the entire built environment. That’s where tools like LEED for Existing Buildings, LEED for Cities and Arc come into play. By 2020, our goal is to transform LEED from a building rating system to a platform to comprehensively support the varied facets of sustainability in our built environment. USGBC strives to help building owners and community leaders continuously improve their building and community performance, whether through saving more water, energy or waste or enhancing the human experience and making occupants and citizens more comfortable. Sustainability is not possible without human health and wellness considerations, and USGBC is the leader that will drive forward a vision of human health in all aspects of the built environment. Through this 2020 vision, we expect to move closer to achieving the vision of green buildings and communities for all within a generation. We at USGBC realize that buildings don't exist in a vacuum. Technology is blurring the lines, driving the need for a more integrated understanding of the essential interplay between buildings and energy generation, transmission and land usage; development, human health and well-being, city infrastructure, financing and investing; and everyday activities like driving to work, taking a train or walking into a grocery store. USGBC seeks to enhance this interconnectedness and transform the built environment through cross-sector, outcome-driven collaborations that strive to make the world a better place and improve the quality of life of millions around the world. I look forward to our future together as we continue to LEED on!